The Living Alone Allowance is an additional payment made every week by the Department of Employment Affairs and Social Protection to pensioners, and some people with special needs under the age of 66, who are living by themselves. It recognises the additional costs that people on low incomes face living alone. For many of those pensioners, the loss of a spouse means their household income may have been halved overnight. But while their incomes might have been cut, their outgoings certainly haven’t and that’s why pensioners living alone are the most likely group of older people to be living in poverty, struggling to make ends meet. So they rely on the Living Alone Allowance for an extra bit of help to pay the bills, to put food on the table, to ensure they can afford luxuries like prescriptions and keeping the heat on. But over the last 22 years, since 1996, the Living Alone Allowance has been increased just once, in 2014, when it was raised by €1.30 to nine euro. That works out, over more than two decades, as an increase of around six cent every year. Think about what you might have spent in 1996 to keep your house warm. Think about what it might have cost to put a fill of diesel into the car or to do the weekly shop. And then ask yourself whether successive governments have done enough to help older people who are living alone. 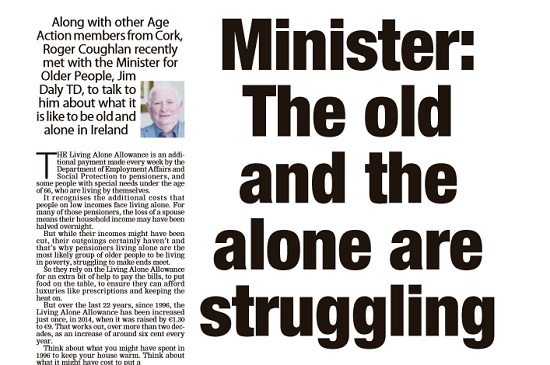 Last week, along with other Age Action members from Cork, I met with the Minister for Older People, Jim Daly TD, to talk to him about what it is like to be old and alone in Ireland. We explained the difficulty of running a home with one income where previously you had been able to rely on two. We talked about what it was like to lose your husband or your wife, the most important support you might have had your entire life, and then to realise how little you would be surviving on for the rest of your days. Research by the Vincentian Partnership for Social Justice confirms the particular challenges facing older people who are living alone. They have examined the actual weekly cost of more than 2,000 goods and services in Ireland. They use this to calculate detailed household budgets for all sorts of different groups of people, including pensioners, and what income they would need to have a minimum standard of living. This shows just how difficult it is for a lone pensioner to make ends meet when a pensioner living in a rural community falls short of that minimum standard by as much as €45. For many older people who are living by themselves the struggle is made even harder by the difficulty in getting proper homecare supports. The waiting lists for home helps across Ireland are getting longer and longer. More older people without someone to care for them are finding themselves forced into nursing homes. That’s why, we explained to the Minister, an increase in the Living Alone Allowance for pensioners this year is so important, along with increased resources for homecare supports. Budgets, I often read, are about making the hard choices. When pensioners have to choose between which medicine they can afford that week or whether they can really afford the luxury of heating a second room, they don’t have much to learn about hard choices from anybody. Older people built this country. Many of us have seen our third or even fourth recession. Pensioners shouldered their share of the austerity burden. As the economy continues, with their help, to grow they have a legitimate expectation that the sacrifices they made will be acknowledged and that the cuts they endured will be reversed. Even with the pension increase, delayed but welcome, that will happen later this month the reality is that only now are the incomes of pensioners being restored to where they were before the recession. To be fair to Minister Daly, he listened to us, he heard what we had to say about helping pensioners who are living alone, to support people who need care at home and to find ways to provide sheltered housing for older people who might wish to downsize. We know he is working on a plan to bring forward a statutory scheme to provide decent homecare in this country and many of us felt that he kept party politics out of the discussion and he focused on the issues. But it’s one thing to be heard. It’s another thing to be understood. Along with other Age Action members, and Ireland’s more than 600,000 pensioners, I’ll be hoping that when the budget is revealed later this year, it’ll be clear that the needs of older people, particularly those living alone, are finally understood.